Pakistan with its capital Islamabad is located in Asia (Southern Asia, bordering the Arabian Sea). It covers some 796,096 square kilometers (slightly more than five times the size of Georgia) with a population of 204,925,000. Urdu, English, Panjabi, Sindhi and Pushto are some of the languages spoken by the majority in Pakistan (consider regional differences). Afghanistan, China, India and Iran are bordering countries. Pakistan is a a large country ( 1.5 times the size of France) in South Asia. Observe the wonders of Karachi, Pakistan's former capital and its largest city, situated on the shores of the Arabian Sea. The magnificent Quaid-e-Azam's Mazar, the mausoleum of the founder of Pakistan, is made entirely of white marble with impressive north African arches. Pakistan boasts some of the highest mountains in the world in Kashmir, including the famous Nanga Parbat and the second-highest mountain in the world, K2. The Baltoro Glacier and the Batura Glacier are the largest outside the polar regions. To reach someone Pakistan dial +92 prior to a number. The local cellular networks are operated on 900 MHz, 1800 MHz, 3G, 4G. Websites typically end with the top level domain ".pk". If you want to bring electric appliances (e.g. battery chaarger), keep in min the local 230 V - 50 Hz (plugs: C, D). The sign for the locally used currency Rupee is PKR. 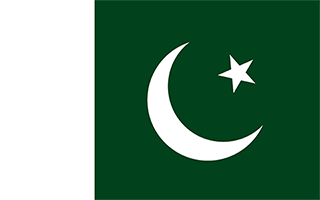 Green with a vertical white band (symbolizing the role of religious minorities) on the hoist side; a large white crescent and star are centered in the green field; the crescent, star, and color green are traditional symbols of Islam. The Indus Valley civilization, one of the oldest in the world and dating back at least 5,000 years, spread over much of what is presently Pakistan. During the second millennium B.C., remnants of this culture fused with the migrating Indo-Aryan peoples. The area underwent successive invasions in subsequent centuries from the Persians, Greeks, Scythians, Arabs (who brought Islam), Afghans, and Turks. The Mughal Empire flourished in the 16th and 17th centuries; the British came to dominate the region in the 18th century. The separation in 1947 of British India into the Muslim state of Pakistan (with West and East sections) and largely Hindu India was never satisfactorily resolved, and India and Pakistan fought two wars and a limited conflict - in 1947-48, 1965, and 1999 respectively - over the disputed Kashmir territory. A third war between these countries in 1971 - in which India capitalized on Islamabad's marginalization of Bengalis in Pakistani politics - resulted in East Pakistan becoming the separate nation of Bangladesh. In response to Indian nuclear weapons testing, Pakistan conducted its own tests in mid-1998. India-Pakistan relations improved in the mid-2000s but have been rocky since the November 2008 Mumbai attacks and have been further strained by attacks in India by militants suspected of being based in Pakistan. Nawaz SHARIF took office as prime minister in 2013, marking the first time in Pakistani history that a democratically elected government completed a full term and transitioned to a successive democratically elected government. Pakistan has been engaged in a decades-long armed conflict with militant groups that target government institutions and civilians, including the Tehrik-e-Taliban Pakistan (TTP) and other militant networks.